The Caraway White Wall Cabinet is an easy way to add space-saving storage and classy style to your bathroom. Below the opaque wood cabinet is an extra faux slate finish shelf where you can put bathroom supplies and essentials. Within this Space Saver Cabinet is an adjustable shelf so you can fit a wide variety of items into it. Bathroom wall cabinet made of opaque wood. Space-saving storage solution. Faux slate finish shelf for various bathroom essentials. Adjustable shelf within the cabinet. 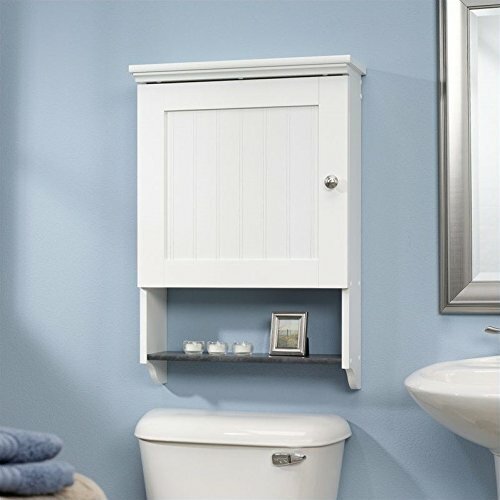 The Caraway White Wall Cabinet is an easy way to add space-saving storage and classy style to your bathroom. Below the opaque wood cabinet is an extra faux slate finish shelf where you can put bathroom supplies and essentials. Within this Space Saver Cabinet is an adjustable shelf so you can fit a wide variety of items into it. Bathroom wall cabinet made of opaque wood. View More In Utility Cabinets. If you have any questions about this product by J and A Accessories, contact us by completing and submitting the form below. If you are looking for a specif part number, please include it with your message. National Brand Alternative 3554460 Design House Over-The-John Cabinet, 2 Door, Oak, 21X26 in.